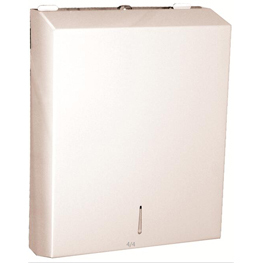 This durable dispenser handles C-fold or multifold towels without adjustment with a sight slot. Large capacity dispenser, it holds 300 C-fold or 500 multifold towels, reducing maintenance cost. Towel cabinet has double latch key lock to prevent towel theft and has a White Enamel heavy gauge Steel construction for durability.